John Elway, a dynamic leader with experience guiding the Broncos to World Championships as both a player and a general manager, enters his eighth season with club in 2018 and operates as President of Football Operations/GM. He was hired by Owner Pat Bowlen to lead the Broncos’ football operations on Jan. 5, 2011.  Inducted into the Pro Football Hall of Fame following a magnificent 16-year career as a quarterback with the Broncos from 1983-98 that included five Super Bowl appearances and two World Championships, Elway is responsible for overseeing all football operations for the Broncos. Named to the NFL’s prestigious Competition Committee in 2017, Elway holds final say on all football-related matters, directing every aspect of the team’s player acquisition process. This includes college scouting research related to the NFL Draft along with pro personnel efforts associated with free agency and trades. Bringing a competitive football and business acumen to the Broncos, Elway has infused the club’s football operations with a winning culture and a positive approach toward building a championship team. In his 23 seasons with the franchise—16 as a player and seven as an executive—the Broncos have appeared in seven Super Bowls, posting as many championships (3) as losing seasons (3). Elway’s vision and aggressive approach toward free agency and the NFL Draft have guided the Broncos’ unprecedented progress in his seven seasons as the club’s lead football executive. Inheriting a Broncos team that finished 4-12 in 2010, Elway has overseen a drastic turnaround in which Denver has posted the third-best overall win percentage (.639 / 78-44) in the NFL since 2011 while capturing five AFC West Division titles and appearing in two Super Bowls. The highlight of Elway’s tenure as general manager was guiding the franchise to its third World Championship in 2015 with a 24-10 win against Carolina in Super Bowl 50. In becoming the first individual to start at quarterback for a Super Bowl winner and return as a general manager to win another, Elway was tabbed as 2015 Executive of the Year by multiple outlets, including ESPN.com (John Clayton). He also received the 2016 Jack Horrigan Award from the Pro Football Writers of America for his qualities and professional style in dealing with the media. The organization has been among the NFL’s most active clubs in improving its roster under Elway. He has aggressively utilized the NFL Draft, free agency, trades and waiver acquisitions to assemble a championship-caliber team. During his seven seasons as an executive, Elway is the only general manager in the NFL during that span who has acquired future Pro Bowl players through the NFL Draft, street free agency, unrestricted free agency and college free agency. The 12 Pro Bowlers Elway has acquired have combined for a league-best 28 total Pro Bowl selections with the Broncos in the last seven years. Including players Elway has signed to contract extensions, he has secured 16 players who have combined for 34 Pro Bowls with Denver since 2011. The Broncos have been awarded a league-high 13 compensatory draft picks during the last four years, demonstrating the success the club has had in securing talent under Elway. Elway was the architect of the highest-scoring offense in NFL history (606 pts.) in 2013 that helped propel the Broncos to Super Bowl XLVIII. Just two years later, he assembled the league’s No.1-ranked defense (283.1 ypg.) that will go down as one of the finest units in NFL history after leading Denver to a victory in Super Bowl 50. With an innate understanding of the chemistry required of a Super Bowl championship team, Elway made a bold move in 2015 to position Denver to return to the NFL’s mountaintop. Coming off four consecutive AFC West titles, he hired Gary Kubiak, a highly regarded and accomplished head coach who had been a part of three previous Super Bowl-winning staffs. The Broncos’ 2015 championship squad contained the perfect blend of talent, experience and discipline, as evidenced by its NFL-record 11 wins by a touchdown or less. Denver’s suffocating defense, in true championship form, held its three playoff opponents—featuring three of the top-four scoring offenses in 2015—to nearly half (50.7%) of their average regular-season point totals. All-Pro linebacker Von Miller, who was Elway’s first draft pick as an executive in 2011, became just the 10th defensive player to be named Super Bowl MVP after totaling 2.5 sacks and two forced fumbles in a dominating performance against the Panthers. The quarterback of the Broncos’ 2015 Super Bowl-championship team was Peyton Manning, a future Pro Football Hall of Famer whom Elway signed as a street free agent in 2012. Manning was named NFL Comeback Player of the Year in his first season with the Broncos before earning his unprecedented fifth NFL Most Valuable Player Award from the Associated Press in 2013. Elway’s 2014 free agent class—Emmanuel Sanders, Aqib Talib, T.J. Ward and DeMarcus Ware—made the Broncos just the second team in league history (Carolina, 1996) to sign four players who made the Pro Bowl in their first year with the team. In all, Denver’s 11 Pro Bowl selections in 2014 represented the most in the NFL and set a team record. Among the Broncos’ Pro Bowl selections from 2014 was a pair of players signed by Elway as college free agents: running back C.J. Anderson (2013) and cornerback Chris Harris Jr. (2011). Denver’s 2013 squad, which advanced to Super Bowl XLVIII, was more than 90 percent comprised of players acquired or re-signed by Elway. The Broncos’ record-setting offense received key contributions from Manning (NFL MVP) as well as unrestricted free agents Louis Vasquez (first-team AP All-Pro guard) and Wes Welker (career-high 10 TD receptions). The Broncos’ 2012 campaign, which included 11 consecutive victories by at least seven points to end the regular season, made Elway the first executive in the Super Bowl era to lead a four-win improvement and deliver a division title in each of his first two years with a team. Elway was recognized nationally by finishing second in The Sporting News’ 2012 Executive of the Year voting. During his first year in his new role in 2011, Elway immediately made his mark as an NFL executive by guiding the Broncos to an historic turnaround. He assembled a team that became only the third since the 1970 NFL merger to win its division and a playoff game with a new head coach following four or fewer wins the previous season. His first NFL Draft class in 2011, which included AP NFL Defensive Rookie of the Year Miller and future Pro Bowler Julius Thomas, produced the second-most starts (56) in the league that season. Free-agent running back Willis McGahee earned Pro Bowl recognition after leading the NFL’s top rushing offense with 1,199 yards. Elway’s initial decision leading the Broncos’ football operations was hiring John Fox as the 14th head coach in team history in 2011. Fox proved to be the perfect fit to start the team’s turnaround, finishing third in the Associated Press’ NFL Coach of the Year voting that year en route to helping the team make four consecutive playoff appearances. Off the field, Elway has spearheaded several innovative efforts to achieve and sustain success for the football team. In 2011, the Broncos became the first NFL team to hire four full-time strength and conditioning coaches to implement adaptive training regimens for players. The team also offers a full-service kitchen and nutrition staff to optimize player performance through customized diet plans. The Broncos under Elway have embraced various methods of football analytics as a tool to support evaluations and situational decisions made by the personnel staff and coaches. Additionally, the team has been at the forefront of equipment testing and technology to maximize the health, safety and performance of its players. Before joining the Broncos as an executive, Elway worked for the Broncos as a consultant in 2010 following more than a decade of gaining significant football and business experience. In eight years as co-owner and chief executive officer of the Arena Football League’s Colorado Crush (2002-09), Elway ran the day-to-day operations of the team from its founding in June 2002. He led the club to an ArenaBowl championship just three years later. Elway was also heavily involved in the Crush’s business operations, including marketing, promotions and sponsorships, with his efforts resulting in the club being recognized as a premier franchise on and off the field. He was named AFL Executive of the Year in 2003, a season in which the Crush won the Commissioner’s Award presented annually to the most outstanding AFL franchise, and was honored as co-recipient of the 2005 Founders Award for his contributions to the AFL and its growth. During his time with the Crush, Elway worked closely with Bowlen, who served as one-third owner of the franchise beginning with its inception. He held various committee assignments, including working as co-chair of the AFL’s competition committee and chairman of the league’s executive committee beginning in 2007. The starting quarterback for the Broncos in five Super Bowls, Elway capped off his tenure as a player for the organization in 1998 by winning Most Valuable Player honors in Super Bowl XXXIII after leading the Broncos to their second consecutive World Championship. He retired as the all-time winningest starting quarterback in NFL history with a career mark of 148-82-1 (.643) while finishing with the second-most passing yards (51,475) and third-most passing touchdowns (300) in league annals. Always driven by pressure, Elway directed the Broncos on a league-record 47 fourth-quarter or overtime, game-winning or game-saving drives in his legendary career. He also earned a franchise-record nine Pro Bowl selections and was named the NFL’s Most Valuable Player in 1987. A 1999 inductee into the Denver Broncos Ring of Fame and the Colorado Sports Hall of Fame, Elway was enshrined into the Pro Football Hall of Fame in 2004. Elway has devoted his time to numerous charitable causes during his three-plus decades in Denver. In addition to starting the Elway Foundation in 1987 to assist in the prevention and treatment of child abuse, he has supported several other organizations, including the Heroes Foundation, the Buoniconti Fund to Cure Paralysis, the Muhammad Ali Parkinson Center and Make-A-Wish Foundation. Along with his wife, Paige, he has collaborated with the Barbara Davis Center for Childhood Diabetes and volunteered with the Boys and Girls Club of Metro Denver. In 2017, Elway was the recipient of the prestigious Mizel Institute Community Enrichment Award honoring his outstanding contributions in sports, business and philanthropy while significantly enhancing the lives of others in the region. He graduated from Stanford University with a bachelor’s degree in economics while concluding his collegiate playing career with five major NCAA Division I-A records and nine major Pacific-10 Conference marks. As a senior, Elway was a consensus All-American and finished second in the Heisman Trophy balloting in addition to setting virtually every Pac-10 and Stanford career passing record en route to being the No. 1 overall selection in the 1983 NFL Draft. A highly touted athlete from Granada Hills High School (Calif.), Elway also played baseball (outfielder/pitcher) at Stanford and was twice selected in the Major League Baseball Draft (18th round by Kansas City in 1979 and second round by the New York Yankees in 1981). He was named the Yankees’ top prospect by Baseball America and played outfield for the club’s short-season Single-A affiliate Oneonta Yankees (N.Y.) in the summer of 1982. Elway’s late father, Jack, retired from the Broncos in 2000 after seven years with the club, including the last five as the team’s director of pro scouting. Born on June 28, 1960, John is married (Paige) and has four children: daughters Jessica Gwen, Jordan Marie and Juliana, and son Jack.